For this dish, the gentle flavour of the pandan leaves softens the strong taste of the chicken, resulting in appetizing bites of chicken meat. 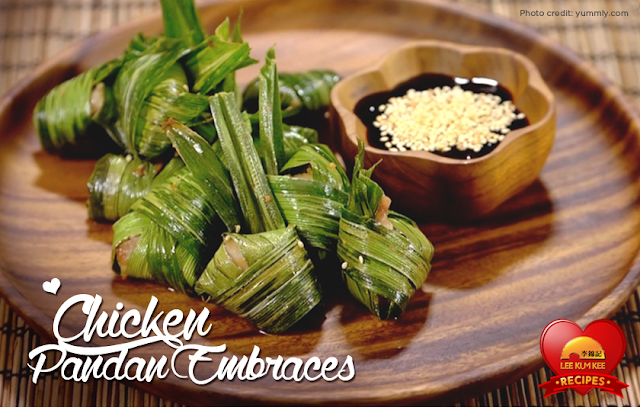 Wrapping the chicken pieces with pandan leaves also allows the meat to be tender and flavourful when they are fried, encased in the protective embrace of the strips of these aromatic leaves. 1. In a mixing bowl, combine Lee Kum Kee Soy Sauce, patis, Panda Brand Oyster Sauce, sugar, ground pepper, garlic, ginger and calamansi juice. Mix well. 2. Put the chicken pcs in the bowl with the mixture and marinate for at least 3 hours or overnight. Make sure to cover the bowl and refrigerate. 3. Wrap the chicken with Pandan leaves. 4. Heat a cooking pot and put the oil in. 5. When the oil is hot enough, deep fry the wrapped chicken until the color turns golden brown. 6. Transfer the chicken into a serving plate and enjoy!